This hand sanitizer comes from Kleenex, one of the most trusted brand names on the market. 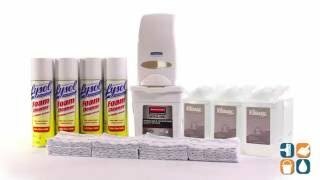 Alcohol, fragrance and dye-free, Kleenex Foaming Hand Sanitizer is effective without the risk of alcohol exposure. It kills 99.9% of the most common germs on hands that can cause illness. Kleenex Alcohol Free Hand Sanitizer is the perfect choice for school classrooms to keep kids and teachers safe and healthy. This refill is for use with KCC92144 Hand Sanitizer Dispenser (sold with this kit - description below). The Kleenex Skin Care Cassette Dispenser can be used with Kleenex hand soap or santizer refills (hand sanitizer refill included in this kit). This 1000 mL dispenser is ideal for use in restrooms or break room sinks. The high capacity design allows for less refilling and maintenance time. Easy to load refills simply click into place and you're ready to go. This disinfectant cleaner from Lysol comes in a thick, foam formula that clings to surfaces, providing a thorough cleaning. 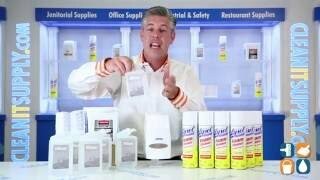 Lysol cleans, shines, disinfects, deodorizes and cuts through grease. Effectively kills MRSA, staph, salmonells, pseudomonas and HIV-1 on hard, nonporous surfaces and prevents the growth of mold and mildew. These convenient disposable cleaning cloths help stop the chain of infection with 99.9% microbe removal. Designed with built-in scrubbing strips, Rubbermaid Microfiber Cloths provide streak-free cleaning of mirrors, glass and stainless steel and are proven to remove C. diff spores. Ideal for dusting as well as wet cleaning, they effectively remove dirt without smearing.